You can download your eBook from our website immediately after your order is completed. Please open the eBook with an e-reader device or App such as Kindle, iBooks, Nook, or other. (See File Formats for more information). You can download your eBooks from the Downloads section of your account page. You can also download it by clicking on the download links in the order confirmation email you will have been sent when your order was completed. Didn’t get the email? See below. If you don’t have an account, you can download your eBook by clicking on the download links in the order confirmation email you will have been sent when your order was completed. Didn’t get the email? See below. Customers with an account receive 10% discount on most purchases and have easy access to downloads from orders placed when logged in. You can create an account here. If you didn’t receive an order confirmation email within a few minutes of completing your order, please check the spam or junk folder of your email provider to make sure the email hasn’t been erroneously marked as spam. If it was, please consider adding info@windhorsepublications.com to your email address book to help ensure that doesn’t happen in future. If you still can’t find your email but have an account, see above for how to download your eBook. If you don’t have an account, please contact us for help. If you use an email program on your computer, it sometimes downloads files into a different folder from the one your web browser uses. Please check your program’s settings to find out where it downloads files if you are not sure. On desktop computers, your web browser normally downloads files to a Downloads folder. Please check your web browser’s settings to find out where this is if you are not sure. 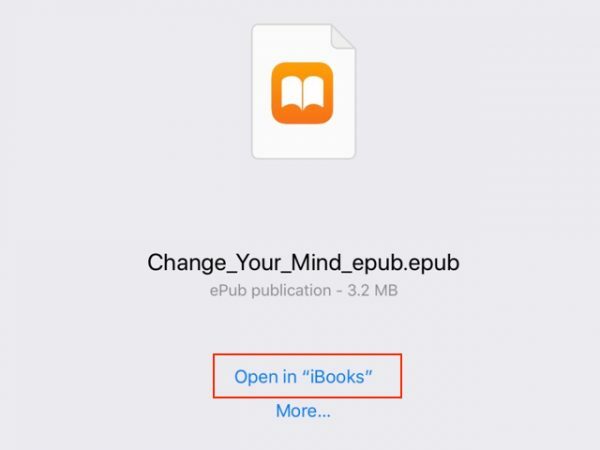 iOS automatically recognises eBooks in epub format when you download them and prompts you to open them in the iBooks app, if it is installed. You should see a bar across the top of your screen as shown below – click on Open in iBooks to open your ebook and add it to your library. ePub files can be read on most e-readers including the Barnes & Noble Nook, Blackberry Playbook, Apple’s iBooks software (on iPhone, iPad and iPod Touch), Kobo, Sony Reader and more. You can use a variety of software to read ePub files including the free Adobe Digital Editions app. mobi files can be read on the Kindle, Mobipocket Reader, Calibre and Stanza desktop amongst others. Many smartphones also support mobi files. Amazon’s Kindle software is available for most hardware. Calibre e-reader software will read most types of files including ePub, mobi and prc, and is available for Windows, Mac and Linux. If you want to transfer your mobi file to a Kindle, please see these instructions. prc files are equivalent to mobi files. If you have a prc file but your device only supports mobi, just change the file extension from .prc to .mobi (see below). A file extension is the part of a filename after the . e.g. .txt in file.txt. If the extension is missing your computer will not know which program to use to open the file. Some operating systems hide the extension of a file by default. To show them, try this for OS X , and this for Windows. If your device says it cannot recognise the eBook file, please check it is in the right format for your device and that the file extension is present. If your ebook files do not show an extension or have an extension which is not .epub or .mobi, and your software cannot recognize or open the files, try renaming the file with .epub or .mobi as the extension, as this often enables the file to be readable. If you need further help with using your eBook, please contact us.